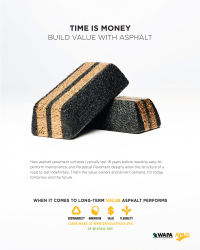 These high resolution full- and half-page magazine ads created by the Asphalt Pavement Alliance and customized with WAPA branding make the case for asphalt pavements. New asphalt pavement surfaces typically last 18 years before needing easy-to-perform maintenance, and Perpetual Pavement designs allow the structure of a road to last indefinitely. That’s the value owners and drivers demand, for today, tomorrow and the future. 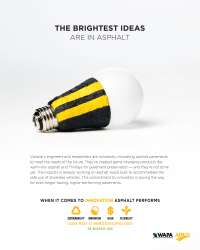 Visionary engineers and researchers are constantly innovating asphalt pavements to meet the needs of the future. 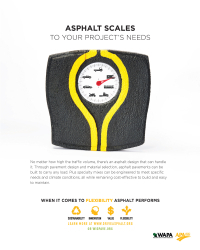 They’ve created game-changing products like warm-mix asphalt and Thinlays for pavement preservation — and they’re not done yet. The industry is already working on asphalt roads built to accommodate the safe use of driverless vehicles. This commitment to innovation is paving the way for even longer-lasting, higher-performing pavements. Asphalt pavements are 100 percent recyclable — in fact, they’re the most recycled material in America. Every time an asphalt pavement is recycled, it diverts waste and other byproducts away from landfills, conserving natural resources. 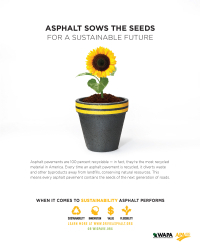 This means every asphalt pavement contains the seeds of the next generation of roads. No matter how high the traffic volume, there’s an asphalt design that can handle it. Through pavement design and material selection, asphalt pavements can be built to carry any load. Plus specialty mixes can be engineered to meet specific needs and climate conditions, all while remaining cost-effective to build and easy to maintain. "Whether at a business, a shopping center, a school, house of worship, recreation area or apartment building, a PARKING LOT is one of the first things a person sees when arriving at their destination. ... Asphalt pavements are the superior choice for parking lots because they are quick to construct, long-lasting, sustainable and easy and cost-effective to maintain." This version of the flier has an asphalt texture background. This version of the flier has a plain white background. “It doesn’t matter if you’re driving in a race, or taking your daughter to school; smoother roads are safer for you and your family. That’s why almost all NASCAR tracks are asphalt, and why I prefer it, no matter my speed.” Half-page version. “When I’m meeting my girlfriend for dinner, roadway construction means missing our reservation. It’s frustrating, but only an inconvenience. When I’m on the job, a delay can be the difference between life and death. With asphalt, construction typically happens at times when fewer cars are on the road, and the delays are counted in minutes. That matters." Half-page version. “Whether I’m training a Special Forces driver in tactical roadway maneuvers, or my son how to drive, I need to know my students can hear me. I choose to train on asphalt roads because they produce less pavement-tire noise, guaranteeing I’m heard, even when my son pretends he isn’t listening. That matters.” Half-page version. “When I bike to work or around town, I am getting exercise and reducing my impact on the environment. At work, I analyze the environmental impact of infrastructure, including roadways. Asphalt pavements are 100% recyclable and can be produced with energy-saving warm-mix technologies. That makes asphalt the sustainable choice, whether you are on two, four, or even 18 wheels. That matters.” Half-page version. To reduce road noise and help keep neighborhoods quiet, asphalt pavement engineers have developed special mixes like open-graded/fine-graded surfaces, as well as modified, rubberized and stone-matrix asphalt that can lead to pavement-tire noise reductions as great as 7 decibels. No wonder 83% of engineers, developers, transportation officials and other key stakeholders chose asphalt as the quieter ride. A smooth road, that’s what drivers want today. Not just for peace and quiet, but also for peace of mind. With asphalt, it is easy to ensure a consistently smooth level of performance; which saves lives, wear and tear on your vehicle, and can improve vehicle fuel economy by 4.5%. No wonder that, in an independent survey, 77% of engineers, developers, transportation officials and other key stakeholders chose asphalt as the smoother surface. Just-in-time manufacturing, farm-to-table freshness, guaranteed overnight delivery — as American business moves, so do the demands on our nation’s roads. Congestion and traffic delays cost the trucking industry $9.2 billion a year. Rough roads increase vehicle wear and tear. It all adds to business costs and purchase prices. Asphalt pavements are easy to maintain cost-effectively, ensuring maximum performance with minimal delay for truckers and everyone who relies on them. 55% of drivers today identify traffic delays due to road construction as the most frustrating part of their driving experience. With off-peak construction, asphalt pavements leave roads and parking lots open when demand is at its highest. Surface maintenance and repair are quick, ensuring drivers and pavement owners have a smooth, high performance surface with minimal inconvenience. No wonder an independent survey found 87% of engineers, developers, transportation officials and other key stakeholders chose asphalt for its ease of maintenance. 55% of drivers today identify traffic delays due to road construction as the most frustrating part of their driving experience. With off-peak construction, asphalt pavements leave roads open to traffic during rush hour. Surface maintenance and repair is quick, ensuring drivers have a smooth, high performance surface with minimal inconvenience. No wonder an independent survey found 87% of engineers, developers, transportation officials and other key stakeholders chose asphalt for its ease of maintenance.